Professor Michael Beizer depicts relief and rescue role of organization that helped millions. 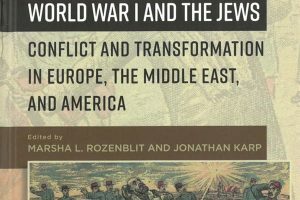 Michael Beizer, Relief in Time of Need: Russian Jews and the Joint, 1914-1924. Slavica Publishers, Indiana University, 2015. 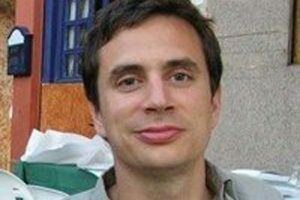 This recently published book, written by Professor Michael Beizer, a historian and Property Reclamation Researcher in JDC’s Former Soviet Union Department, depicts the activity of JDC in Russia during the time of World War I, revolution, civil war, pogroms the famine of 1921-1923, and reconstruction work. In his broad historical survey, Beizer highlights the main stages in the development of the organization’s activity and the location of its programs. Structurally, the book’s eight chapters reflect the basic phases in the early history of JDC in Russia; among them: “The Joint Distribution Committee and the Jewish Committee for the Relief of War Victims”, “In Siberia under the Whites”, “In the Former Pale of Settlement”, “Under the Auspices of the ARA” and “Last Years of Relief Work – 1923”. Within this chronological framework, the author deals with various aspects of relief aid. Orphaned children in the Malakhovka Colony show off the new winter garments they’ve received from JDC. Beizer provides readers with a painful account of cruelty and inhumane treatment which the Jews of Soviet Russia experienced during the long years of calamity from 1914-1924. 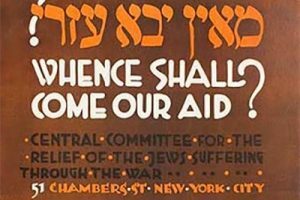 The sufferers were especially grateful to American Jewish philanthropists for their concern and the humanity they expressed by providing assistance to them in their time of need. Many of the aid recipients viewed the philanthropists as emissaries representing their family members in the United States. 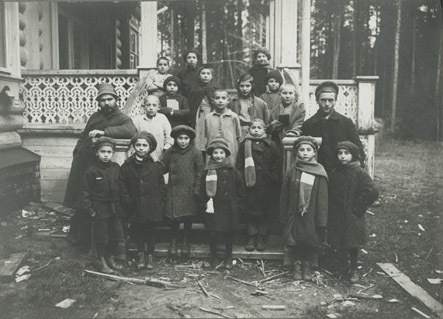 Immediately after the end of the Russian Civil War in 1921, the focus of “the Joint,” as JDC is often called, shifted from distribution of emergency money and food to famine relief, healthcare, the organization of children’s homes and shelters for orphans, and care for the elderly. At that critical moment, the Joint collected and distributed clothing and other articles of prime necessity and equipment for Russia’s starving and needy. It rescued many from famine and supported tens of thousands of Jews and non-Jews alike. In his book, Beizer explains how, in a situation when there were no official diplomatic relations between the USSR and the United States, and amid deep mistrust and ideological incompatibility between the two countries, JDC had to maneuver between the Soviet Government and the U.S. State Department. This included fighting off attacks by the American Yiddish press and the Jewish section of the Bolshevik Party, showing extreme flexibility during negotiations, and adapting to the peculiarities of the Soviet regime, while at the same time implementing JDC’s policies. Published soon after JDC’s centennial year, Beizer’s book is a respectful tribute to the memories of the Joint’s employees, who often worked at great risk to their lives.They include Dr. Frank Rosenblatt, who participated in a mission supporting the Jews of Siberia, the Urals, and Far East in 1919, and Dr. Boris Bogen, who headed JDC’s Overseas Unit. Other heroes mentioned include Harry Fisher, Max Pine, and Joseph Rosen. There are pages describing the Joint’s first human losses – Israel Friedlaender and Bernard Cantor. The author proudly admits that “this organization owes its achievements to its remarkable staff.” The late Ralph Goldman, Honorary Executive Vice-President of the JDC, highly recommended this book to all people involved with or interested in Jewish community work in the Former Soviet Union. Research for the book was conducted in many archival repositories of the United States, Israel, Russia, Ukraine and Belarus. JDC Archives records and photographs are a primary source for the publication.